It has been just over a year since the Hartzell team entered the world of social media. In that time we have announced new aircraft partnerships, traveled the globe with the world’s fastest motorsport, given fans experiences they will never forget, celebrated historic events and formed connections with thousands of pilots and aviation enthusiasts. We even celebrated Shark Week. This year we want to do even more, and we are starting by offering up our incredible team of aviation experts to answer your questions. 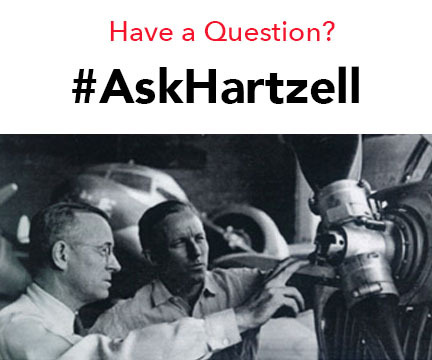 Tweet at @Hartzellprop with #AskHartzell or send us a message on Facebook between now and next Tuesday, and we will answer your aviation questions in the coming weeks. Ask an especially interesting question, and we may send you more than just an answer in return. We’re answering your questions: Send a tweet with #AskHartzell or send us a message on Facebook between today and Tuesday, March 24th.